Hello! I styled my look around this metallic circle skirt. This skirt has been my go-to skirt this summer when trying to figure out what to wear. The versatile silver-y shade allows me to pair it with essentially any color and/or print. Additionally, I cannot resist the flattering, skater shape of the skirt. For a simple look, I threw on a basic printed tee. 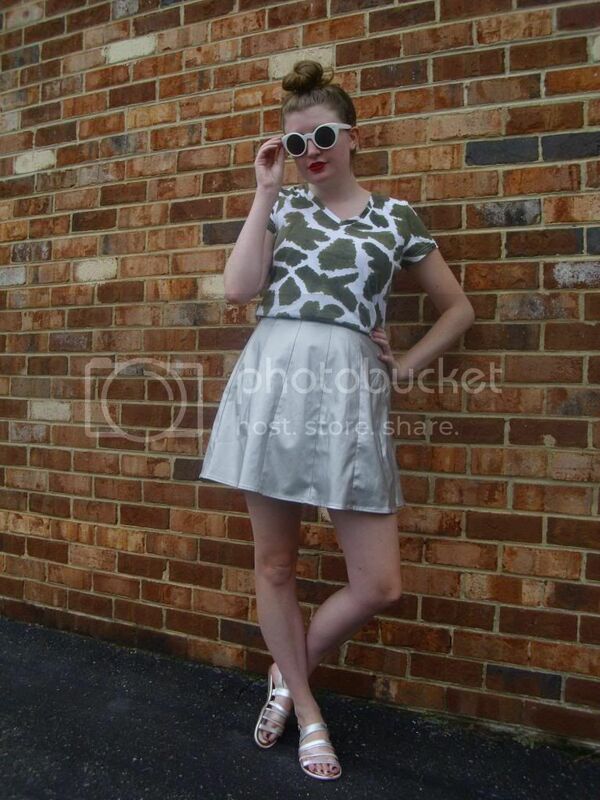 I emphasized the metallic color of the skirt with basic silver sandals. Red lipstick, a messy top bun and white sunglasses completed the look. Hello! It's crazy to think that it's almost August and that fall is slowly encroaching on us. Which means lots of back to school shopping! Today, I whipped up my fall 2014 wishlist. 1. Black high-waisted jeans. Such a versatile piece that can be styled so many different ways. 2. Printed dresses. Ideal for layering on chilly fall days or pairing with simple boots on warmer days. 3. Neutral crossbody bag. Grab this bag to hold your cell phone and keys for a night on the town. 4. Dark statement sunglasses. Add an instant dose of style to your look. 5. 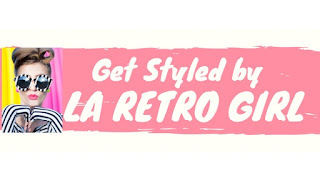 Classic tote bag. Perfect for toting books to class. 6. Deep shade of lipstick. One of my favorite things about fall is the return of deep lipstick shades. Hello burgundys and deep reds! 7. Oversized sweater in a fall tone. Perfect for throwing on over a breezy dress or with simple leggings and boots. 8. Neutral ankle boots. The perfect shoes for so many different looks! 9. Gold statement necklace. You can never go wrong with a gold statement necklace. 10. Cut-out boots. I've been lusting after a pair for a while now and I'm determined to add a pair to my fall wardrobe! What are on your wishlists this fall? Hello! These are a few more photos from my shoot on Tuesday with Nicholas Von Thrower. Again, the photos turned out incredible and I am extremely grateful that he wanted to take them. 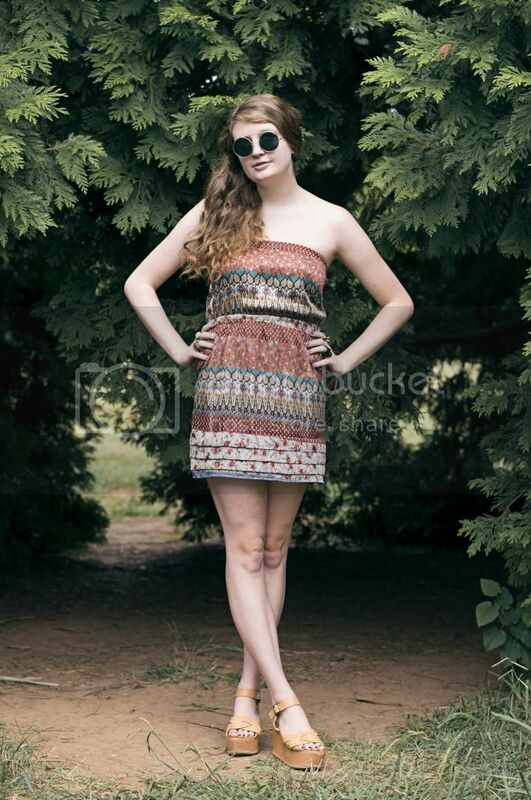 Nicholas is definitely an up-and-coming Richmond photographer to watch out for. 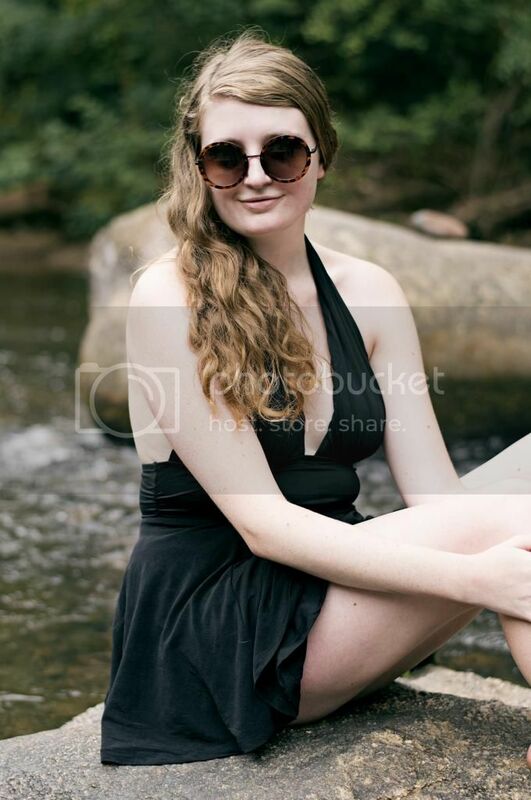 We shot the photos along the river at Texas Beach. Whenever I go to the river here in Richmond, I tend to either go to Belle Isle or Pony Pasture. Before Tuesday, I had actually never been to Texas Beach. But the second we started walking on the Texas Beach trail to the river, I instantly fell for Texas Beach. It is incredibly gorgeous and a lot quieter/calmer than Belle Isle. This will definitely be the spot that I head for on my next river excursion. For the photos, I slipped on my black one-piece. 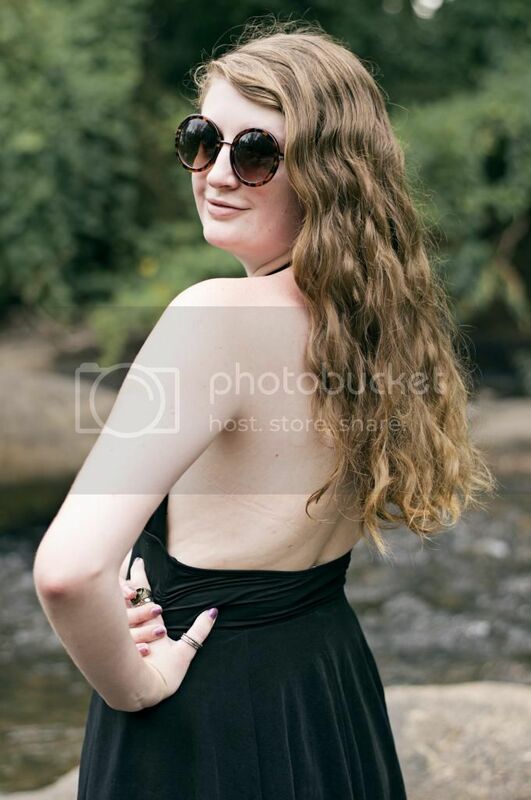 I'm usually more of a bikini girl but the low back and plunging neckline of this swimsuit are too flattering to resist. Of course, I love the simple black color and basic style. This swimsuit has actually been in rotation for several summers now but I love it too much to give it up. Luckily, I haven't outgrown it! 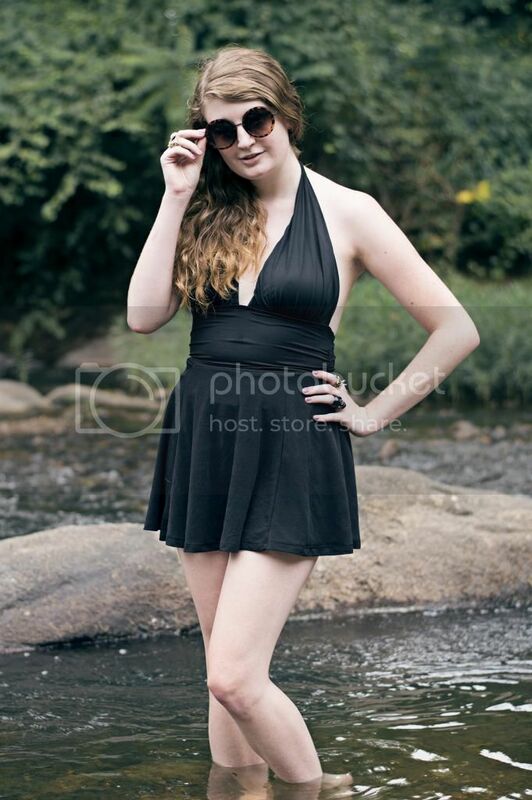 I styled the swimsuit with a black circle skirt for a cute, retro look. 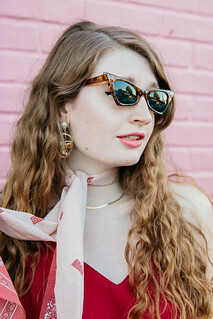 Tortoiseshell round sunglasses and a pile of rings completed the simple, river look. A big thanks to Nicholas Von Thrower for taking these photos! Be sure to check him out on Instagram @fireballwhiskeyprince. Hello! These are some photos from my shoot yesterday with Nicholas Von Thrower. When Nicholas contacted me via Instagram to see if I wanted to shoot some photos with him, I was totally in. Nicholas is a Richmond photographer and is majoing in photography. Once he gets out of school, he hopes to do editorial photoshoots. And oh my gosh, his photos are absolutely incredible. Teaming up with him for a photoshoot was the best. 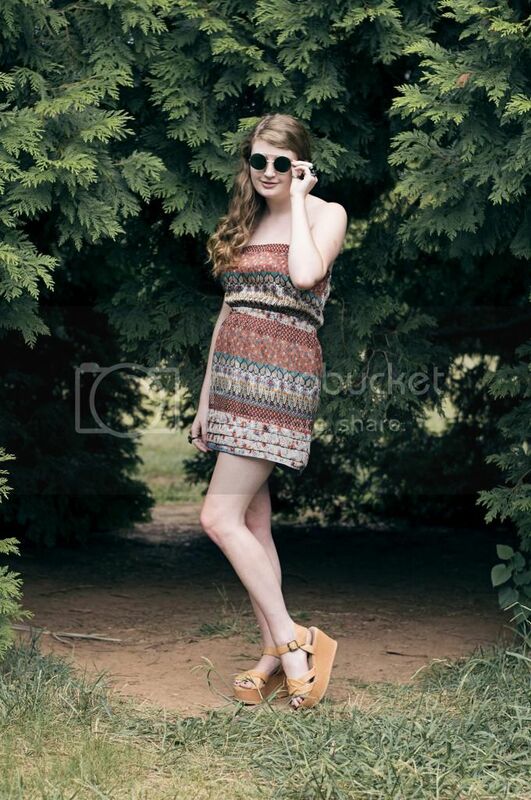 And I love how the photos turned out! Be sure to follow and check out his instagram @fireballwhiskeyprince to see more of his photos. We shot the first look at Maymont. I decided to go for a bohemian look nostalgic of the 60s/70s with this vivid printed dress, tan flatforms and green round sunglasses. Hello! 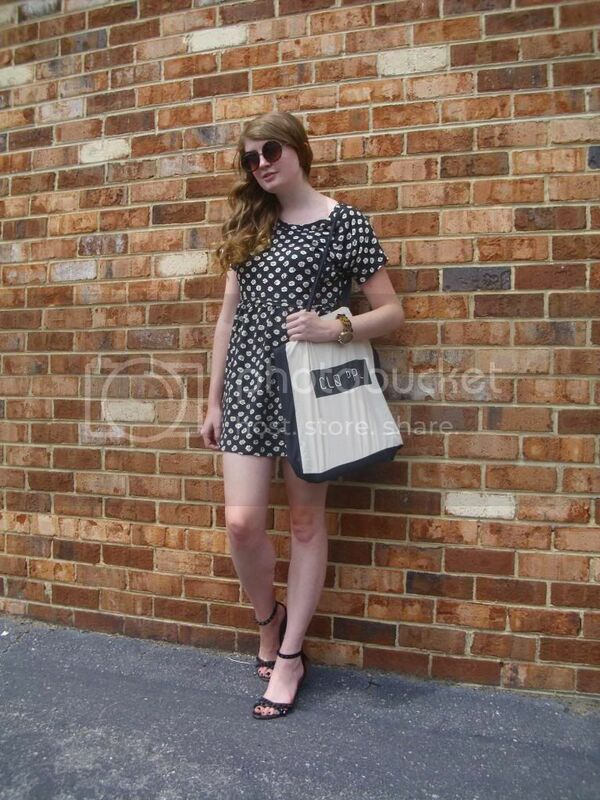 Hot summer days like today require breezy summer dresses like this daisy print, babydoll dress. I kept my look relatively simple by adding a cotton tote bag, classic tortoiseshell watch, round sunglasses and black studded sandals. Do you guys have a go-to outfit for hot summer days like today? As a side note, make sure you follow me on instagram @ToriRadday for a closer glimpse at my life. I post more personal photos on my instagram and today, I posted an adorable one of my little Yorkie posing with me. Hello! Today, I broke out my recently purchased romper. 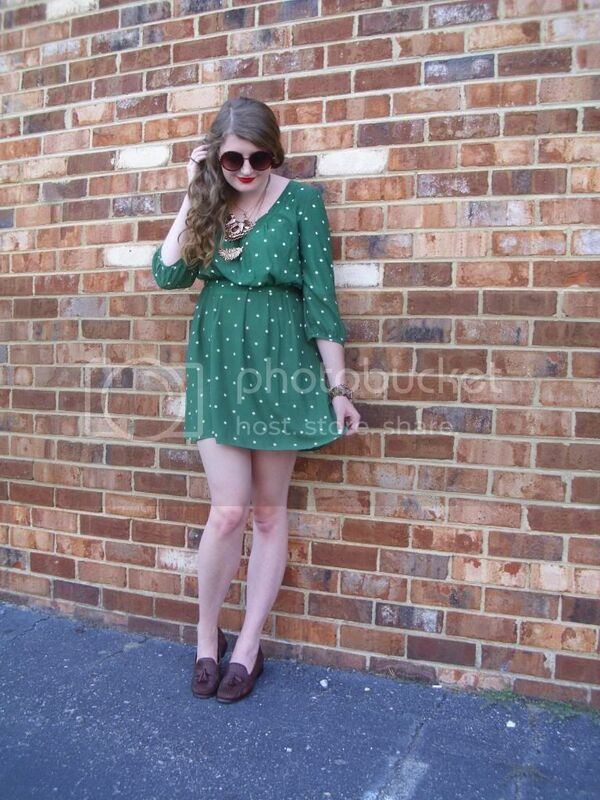 This is the "Meso-Mayhem Romper" in a size large sold by Clique People on ShopLately. It sells for $25+shipping. Since I had a little bit of credit in my account for referring friends to the site, I decided to scoop up this treasure. I love the bold orange and navy color combination and tribal print. The fact that this romper has pockets is a major plus! I'm very glad to have added this romper to my wardrobe. 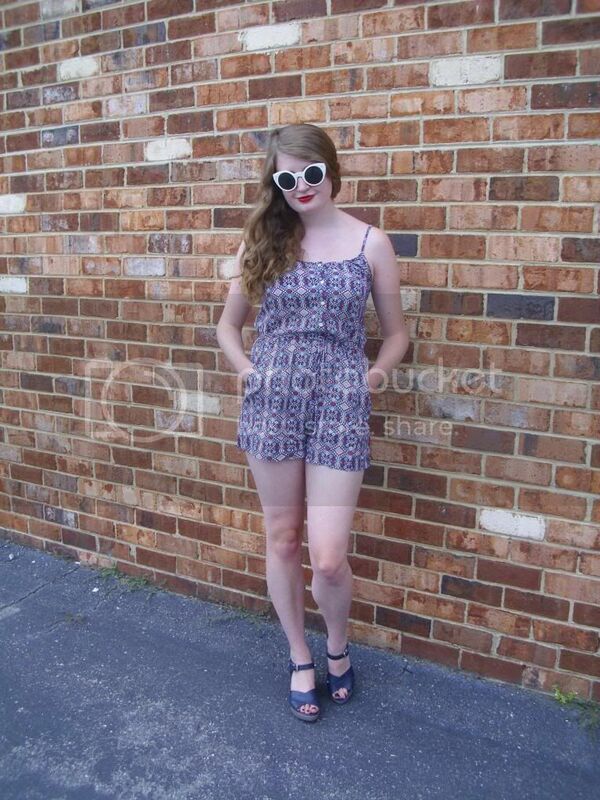 White sunglasses, navy wedges and red lipstick complemented the romper. Hello! This hot weather in Richmond is killer; as I'm typing this blog post, it is currently 96 degrees. Much too hot to throw on anything other than a lightweight dress or romper so I pulled this green polka dotted dress out of my wardrobe. It's been a few months since I've worn this dress for a post on here but in reality, I wear this dress very frequently. The bold green color and polka dot print are simply irresistible. 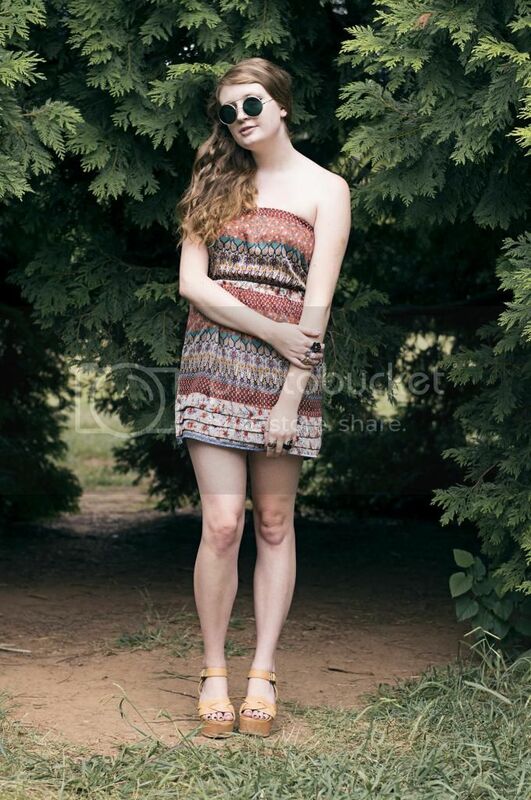 And the fact that this dress has pockets? Absolutely perfect. I've been relatively minimalistic with my jewelry lately but decided to grab a bunch of my favorite pieces and style them together for a bold look. A combination of several golden necklaces, a tortoiseshell watch, golden bullet bracelet, golden spiked ring and black skull ring instantly drew attention to my look. 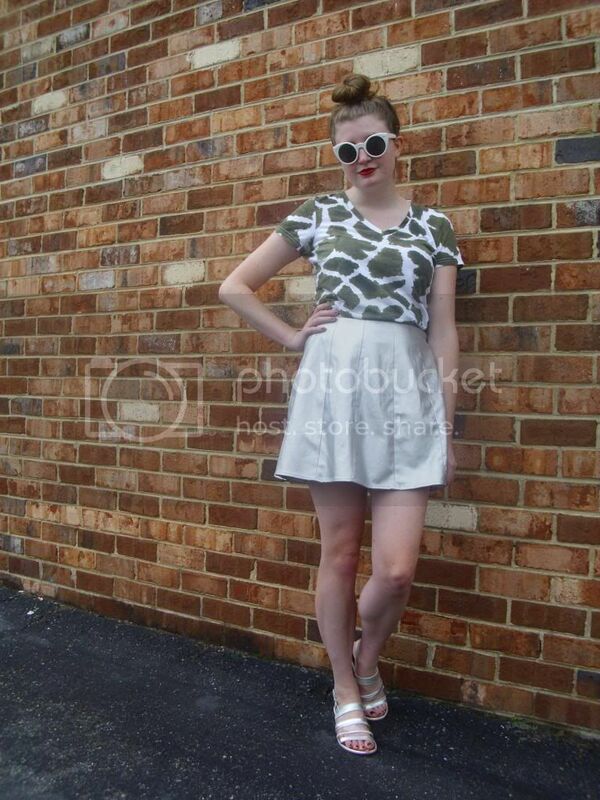 Vintage loafers, round sunglasses and bold red lipstick perfected the look. Hope that you guys are surviving this fierce summer heat! Golden bracelet: CrossRoads Trading Co.
Hello! These photos were taken and posted on instagram (@ToriRadday) yesterday but I didn't get a chance to publish on my blog. I styled my look around this bright, cheery floral romper. Fashion Nova recently sent me this floral romper to showcase on my blog and instagram. This is the "Midnight Garden Romper" and it retails for $27.99 + shipping here. Although I only just received this romper in the mail this week, it may be one of my top favorite items in my summer wardrobe. The lightweight fabric and easy shape of the fabric make it ideal for the hot summer weather. The shape also makes my legs look even longer than usual which I cannot resist! 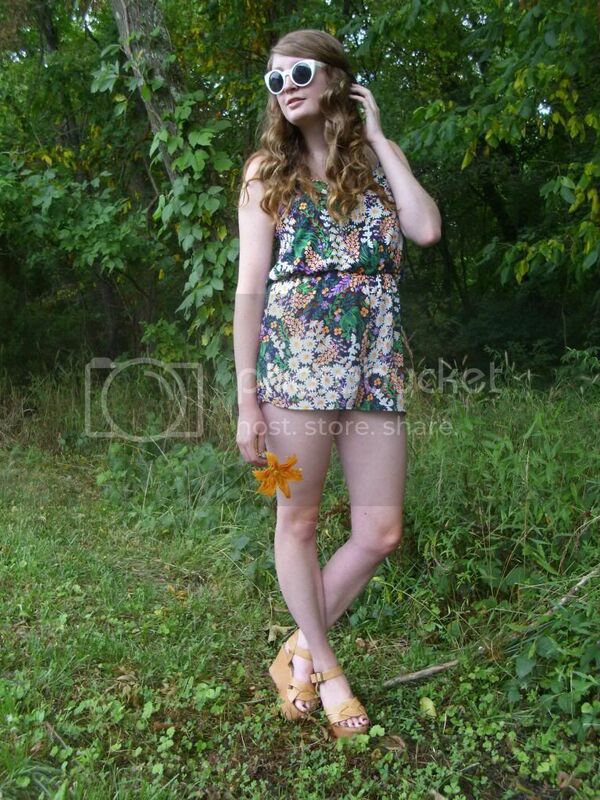 Additionally, I'm absolutely in love with the bright colors and stylish floral print of the romper. 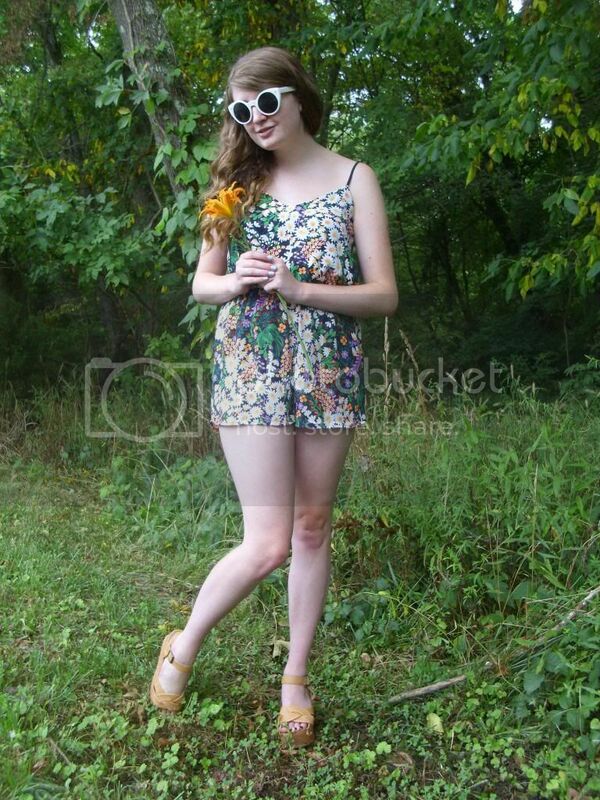 White sunglasses and tan flatforms complemented the colors present in the romper. Hello! Today marks the 5th year anniversary of this blog. And I can hardly believe it. When I was just 13 and started this blog, I had no idea that I would continue blogging this long nor did I realize how much I would love and learn from blogging. Blogging has provided me with opportunities to meet like-minded people, features on numerous websites and very valuable experience. Blogging has become a major part of my life and largely affects the way that I think and live my life. If I hadn't started my blog five years ago, I truly believe that my life would be nothing like it is today. Who knows if I would have still wanted a career in fashion or have such a desire to write for fashion publications once I'm out of school? 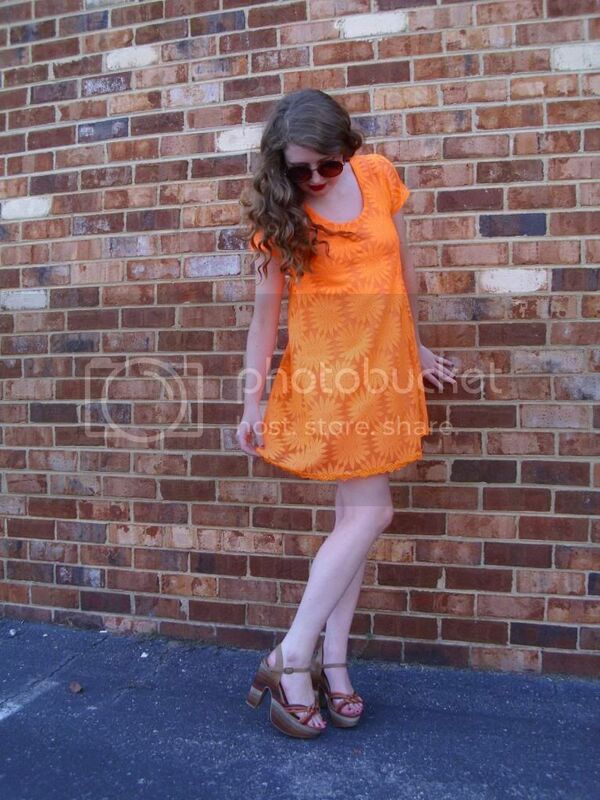 To celebrate my blog anniversary, I donned a bright orange dress. This dress is the newest addition to my wardrobe and a very unusual one; I tend to shy away from color so it even surprises me that I purchased this one. 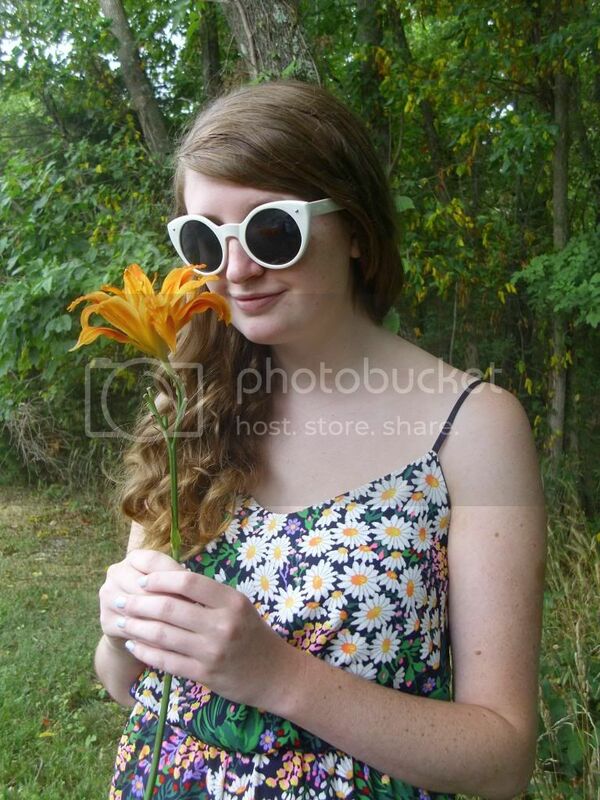 The color is so bright that my mom stated that you need sunglasses to look at it. Of course, that's an exaggeration but I don't remember the last time that I ever wore something this bright. Years, perhaps? 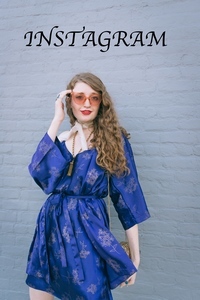 However, when I saw this dress at the Urban Outfitters clearance sale yesterday, the color actually drew me in and I immediately began searching for one in my size. Luckily, I found one and fell in love when I tried it on. In addition to the stunning color, I adore the textured lace, sunflower print and retro, mod shape of the dress reminiscent of the sixties. Better yet? The dress was on sale for just $15 when it originally retailed for $70. Can't say no to that! Round sunglasses, bright red lipstick and striped heels completed the look. Hello! This heat in Richmond combined with the awful humidity Richmond is known for has been almost unbearable this summer. I've been sticking to a uniform of a basic dress paired with a few accessories and an easy pair of shoes. It's too hot to wear much else! Tomorrow it's supposed to reach 100 degrees and I'm not quite sure how I'll be able to handle it. 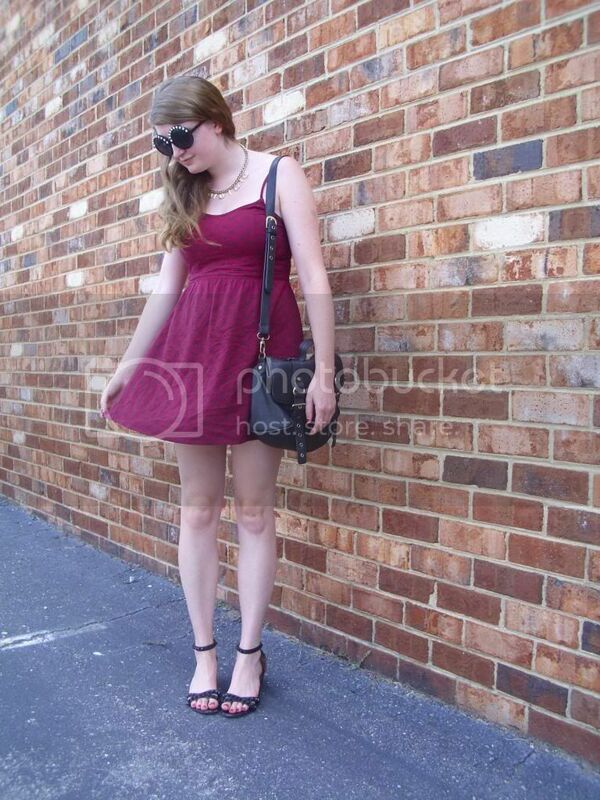 Today, I reached towards the back of my wardrobe to pull out this rosy maroon dress. It is printed all over with a simple black X print and made from the perfect lightweight fabric to keep cool. Well, as cool as one can keep in this heat. 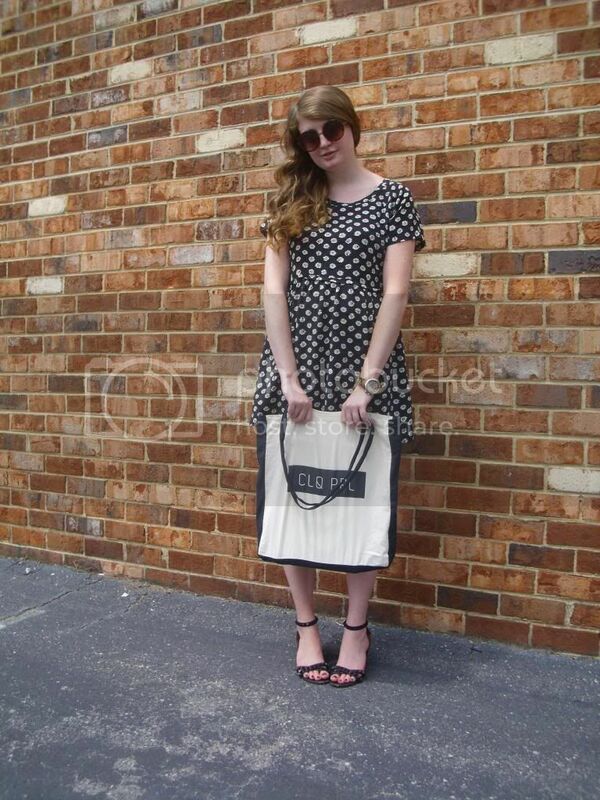 I styled the dress with my pair of black studded sandals and oversize black satchel bag. A golden necklace and pearl trimmed sunglasses added the finishing touch to this look. Hope that you guys are surviving this summer heat!